John McManus jailed for attack on OAP. A drugged-up criminal who targeted a 93-year-old man in a violent car-jacking in Todmorden has been jailed for more than six years. Pensioner John Howard had popped out on a Sunday morning last October to get his paper and visit his brother, but after he called into a nearby shop he was attacked by John McManus in the School Lane area of the town. Prosecutor David Hall told Bradford Crown Court that Mr Howard grabbed the hatchet in the tussle, but McManus snatched the keys to the Citroen Saxo and then forcibly threw the pensioner onto the ground. Mr Howard landed on his right shoulder and hit his head on the kerb causing his glasses to fall off. McManus drove off in the car and during a pursuit involving the police he collided with another vehicle before abandoning the Saxo. The robbery was witnessed by another motorist who saw Mr Howard lying on the road visibly shaking from the shock of the attack. McManus was arrested later that morning and the keys to the Saxo where still in his pocket. In a victim personal statement provided Mr Howard said he was sore all over his back after the robbery and had not been able to walk properly since the incident. The court heard that he looked after his 96-year-old wife, but he was no longer as good at movement as he was before the attack. 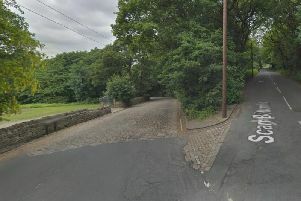 Mr Hall revealed that McManus, of Redcar Street, off Hanson Lane, Halifax, had 45 previous convictions for more than 100 separate offences, but his barrister Anne-Marie Hutton said the attack on Mr Howard was the most serious crime he had committed. “His record makes poor reading,” she conceded. McManus had been due to stand trial but over a video link to HMP Leeds he pleaded guilty to charges of robbery, possessing an offensive weapon and dangerous driving. Miss Hutton said her client was now thoroughly appalled by his behaviour and wanted to apologise to his victim. She said at the time of the robbery McManus felt like “his head was all over the place” and he hadn’t slept for two weeks. Jailing McManus for a total of 80 months Recorder David Osborne said Mr Howard had had the misfortune to run into the defendant that Sunday morning.